The Samsung Gear Fit 2 is a proper evolution of Samsung’s fitness tracker - and, in conjunction, their S Health tracking system. However, it doesn’t do enough to replace more focused trackers that fitness enthusiasts may already wear. Gear Fit 2 – can Samsung get fitness tracking right? The fitness segment of wearables is as crowded as ever, and even though smartwatches are trying to converge on that territory, there is still a market for active-specific devices. Samsung brought one in the form of a wrap around wearable called the Gear Fit, and then we never really saw it again. Until now – Samsung has released the Gear Fit 2 to take on the fitness trackers of the world. Does it keep up with the competition or does it get left in the dust? Is the Gear Fit 2 the best fitness tracker or should you get a dedicated unit? Find out in this, our full Samsung Gear Fit 2 review. Buy the Gear Fit 2 now! The Gear Fit 2 is a lot like the original Gear fit in terms of design – it is still a wraparound device that isn’t afraid to stray away from a more conventional watch form factor. Instead, the plastic band simply wraps around the wrist and fastens with a simple nub on one of the arms that goes into the holes on the other. Finding the right fit isn’t that difficult, as the Gear Fit 2 comes with detachable wristbands in small and large sizes, with plenty of notches to fit all manner of wrists. Though proprietary, there are other colors of these bands for those of you that like to customize your products. Once wrapped around, this is basically a small peripheral that sports a sizeable, curved touchscreen accompanied by a couple of buttons on the right side and an optical heart rate monitor that rests on the skin. The lower button on the right returns the user to the homescreen, while the upper button is for going backwards in the Tizen UI. They are easy to find and have a good click to them. But most of the navigation on the Gear Fit 2 is done on the 1.5 inch Super AMOLED display, which has a resolution of 432×216. Swiping from side to side brings the user to the different widgets that include shortcuts to the heart rate monitor, workouts, and trackers for water and caffeine intake. The colors on the AMOLED screen are where one would expect from Samsung, and the display is properly responsive for getting in and out of the various features. While the display does a good job of showing workout, sleep, and heart rate information, it does have a limit when receiving notifications – often emails and long messages will be eventually cut off, ending with the ability to reply (depending on the app in question) or the option to open the notification on the paired smartphone. The display does a good job of showing its information without requiring a whole lot of squinting – but as with any wearable, it is not the most ideal place to read longer forms of text. Overall, the Gear Fit 2 doesn’t weigh down the wrist and it is light enough to generally forget it is even there – given how easy it is to put on, removal and replacement when necessary is as easy as it can be. And in most situations, the Gear Fit 2 can handle some punishment – with a IP68 certification, it is water resistant. Though it is not specifically rated for swimming or showering, everything from hand washing splashes and full showers haven’t done any damage to the Gear Fit 2. 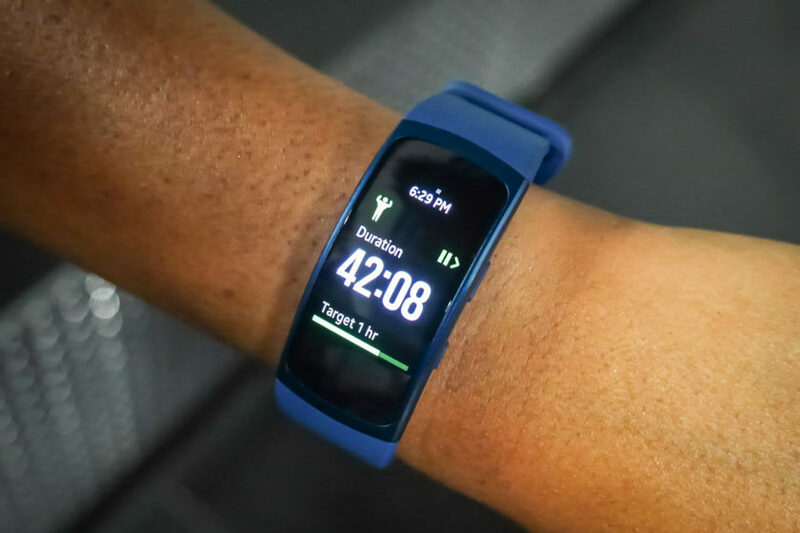 The Gear Fit 2 comes with a few extra features required of a proper fitness device, and that includes GPS, Bluetooth, the heart rate monitor, and 4GB of onboard storage that can be utilized from the Gear Manager on the smartphone. To start off, the 200mAh battery allows the Gear to go for a few days without needing to dock it into the included proprietary charger. When paired to the phone and receiving messages, a few days happens pretty easily – however, at one point I used the wearable without the Bluetooth on and it lasted plenty longer, close to 5 and a half days. When tracking workouts consistently, the device will obviously drain battery faster. Your mileage will vary – pun intended. Samsung smartphones aren’t particularly required to enjoy the benefits of the Gear Fit 2, as the device can be paired to phones that have the Gear Manager and S Health installed. In my case, I was able to have the phone paired to the OnePlus 3, and even look at the information transferred to the phone through S Health, installed via the Play Store. Those who listen to music during workouts can use a Spotify app on the Gear Fit 2, but that does require the phone to be in range. On the other hand, users can transfer local music files to the device via the Gear Manager and listen to music that way – simply pair a Bluetooth headset to the Gear and it will play music from the built in music player. It works quite well and provides a convenient way to bring audio along for workouts without having to rely too heavily on the smartphone. Audio prompts of how long or how far the activity has gone are routed to the headphones, as well, which is useful. Though users can manually start workouts, one important facet of wearables today is the ability to automatically recognize activity. GPS is always on in the Gear Fit 2, used in conjunction with the accelerometer in order to track distances and possible workouts like walking, running, and hiking. When used with workouts, the GPS needs to lock onto the user and then the path of the activity will be saved for later viewing. Getting a GPS lock tended to take a little while, but once it was set, workouts were properly tracked in both the device and the smartphone’s S Health application. Distance is one way of tracking a workout, but monitoring one’s heart rate is another option. The optical monitor also does automatic tracking, focusing on resting heart rate through measurements every 10 minutes. The lower one’s resting heart rate is, the better the person’s general fitness is – so, this is a welcome feature of the Gear Fit 2. For the most part, it is fairly accurate and gives a pretty constant look at one’s personal health. On the other hand, using the heart rate monitor during workouts is very hit or miss. To begin with, heart rate monitoring is only available for basically cardio workouts like running. I personally prefer lifting exercises over straight cardio, so this means that the heart rate monitor is less useful for me. And even then, the accuracy of the monitor during high intensity workouts is worse – when compared to a chest-mounted monitor like ones made by Polar, the heart rate is often more than a dozen beats off of the real mark. This is often the case with heart rate monitors on wrist wearables, but it means the Gear Fit 2 is not made for those enthusiasts who micromanage their workouts. The Gear Fit 2, as mentioned, is able to automatically track activity, but that is also true for sleep. When registering little to no motion while sleeping, the Gear Fit 2 can tell users the ‘efficiency’ of rest. It seems to take a while for the device to register that sleep is over – likely because obvious movement first needs to happen – but a notification showing the percentage of sleep efficiency will eventually greet users in the morning. Mine was always in the nineties, which seems a little suspect, but at least movement graphs in the S Health app show a little more information. That said, one of the more useful features of a smart wearable is missing in the Gear Fit 2 – wake up alarms. Personally I think that using vibration feedback for alarms is one of the most important features for a smartwatch – a smart fitness wearable, moreover – to have. When walking or running around in general, the Gear Fit 2 will try to track the activity – for example, when I attended Anime Expo, the long walks to and from areas in the Convention Center made the wearable vibrate and prompt me about my current length of activity, sometimes telling me to ‘keep it up’ or keep up the pace.’ All of this tracking goes toward the overall amount S Health recommends – either one hour or the default 6000 steps. Starting actual workouts is simple – just swipe over to the workout widget, select the type of activity, and hit start. There are a few different options for tracking, like distance, pace, or calories burned. Heart rate monitoring happens consistently during cardio movements and does not happen at all when doing other activities – setting “Other Workout” for weight lifting kept the monitor off, which I already mentioned is not ideal for me. There are other workouts found lower on the list, including bodyweight exercises like squats and crunches. These are actually pretty useful, as the device uses the built-in meters to register movements based on the prompts displayed before starting. In one case, doing a bunch of squats required an almost crossed arm position so that the Gear Fit 2 knew when it was lowered and lifted due to the movement. This part of the fitness tracking is kind of nifty, albeit rather simplistic. And that is, basically, the best way to describe the Gear Fit 2 in terms of a fitness tracker – like quite a few trackers made by companies that are not already entrenched in the fit world, it is best used as a way to get a glimpse into one’s daily activity. For full fitness enthusiasts, it isn’t the most accurate tracker but comes with a number of good tools – users can even track how much water or caffeine has been consumed. To track resting heart rate and steps, the Gear Fit 2 does a pretty good job – when the activity gets more intense, usage ultimately gets a little tougher to accurately track. And for people who are already serious about fitness tracking, the Gear Fit 2 may not do enough to replace their already existing solutions. Tizen is the interface used in the Gear Fit 2, as is the case with the current Gear family of wearables. It is simple, easy to navigate, and provides a proper suite of tools. Notifications are routed to the wearable, so that users will not miss any important messages or alerts. These can be active on a per-app basis, easily changed in the Manager. When notifications arrive, they are displayed in a scrollable block of text with some options on the bottom. The options are very limited, however, as replies to messages can only be done on either the built-in Samsung SMS messenger and Facebook Messenger. The Google Messenger app, for example, does allow reading back the conversation, but replying relies on canned responses or emoji. And as mentioned before, long form messages are eventually truncated – this isn’t a big deal for a fitness wearable, since reading full e-mails isn’t something that should be done during activity, but it is important to keep in mind. As this is Tizen on the Gear Fit 2, the Gear Manager and Galaxy Apps systems are required to install extra applications and watchfaces on the device. Watchfaces and widgets are easy to change on the wearable, requiring just a long press on the screen in order to trigger customizations. However, when going into the actual app stores, there is a severe lack of third party applications. I was very happy to find one well-designed and functional watchface, but that’s about all I’ve found in terms of extras. Especially since the original Gear Fit was available quite a while ago, we thought there would be more developed apps. As so, there you have it. A smart wearable by Samsung that hopes to give users a better look into their daily fitness. When taken in the context of fitness trackers, the Gear Fit 2 finds itself among an incredibly crowded market filled with companies that have a lot more experience in the fit world. That said, Samsung has done a great job of adapting their mobile knowledge into the fitness space, and the Gear Fit 2 is slightly above average in terms of tracking. It unfortunately pales in comparison to much more focused trackers, especially when it comes to heart rate during workouts, but as a way of snapshotting daily activity and consumption, this and S Health are good for the user that needs more than nothing. If you are already tracking your health with another device, the Gear Fit 2 will probably not replace what is already sitting on your wrist. But for everyone else, the appropriately priced $179.99 Gear Fit 2 is a good start that provides just enough to be useful. What do you think of the Gear Fit 2 and do you plan to buy one? Do you like fitness trackers on your wrist? Let us know your views in the comments below!